Waking up to the smell of freshly brewed coffee will NEVER get old. Never ever will I tire of waking to the sound of the coffee pot gurgling away while the smell of richly roasted caffeinated bliss wafts through the air. I love coffee (and the ritual of drinking coffee) so much that I sometimes text Stacie late at night to say “I can’t wait for coffee tomorrow.” To which she always responds, “I know! 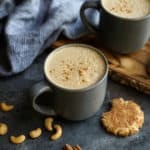 I can’t wait either.” Clearly, we have a thing for coffee, so it’s only fitting that we’re sharing this recipe for Snickerdoodle Cashew Coffee today. Before you decide that cashews and coffee shouldn’t go together – hear me out. 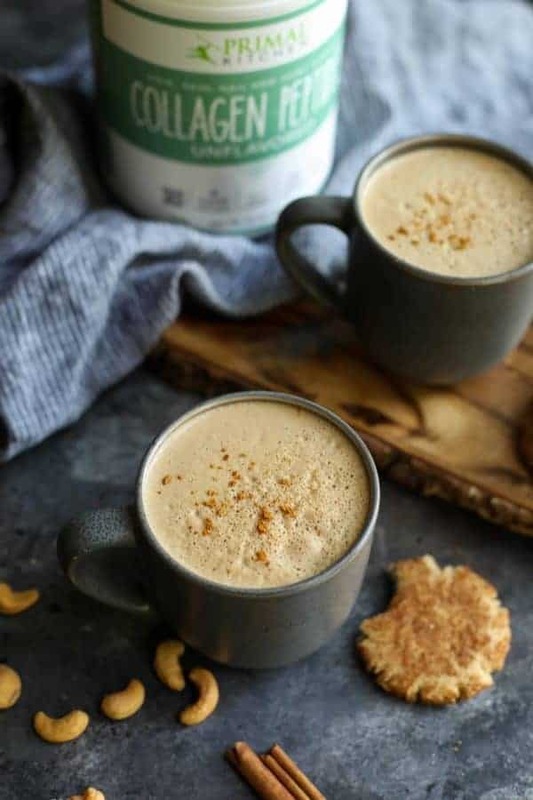 If you like your morning cup to be ultra creamy without dairy or other non-dairy creamers of questionable creaminess (you know the ones, the ones that look super creamy on the package but then end up thin and unimpressive in your cup), then this Snickerdoodle Cashew Coffee needs to happen in your life. 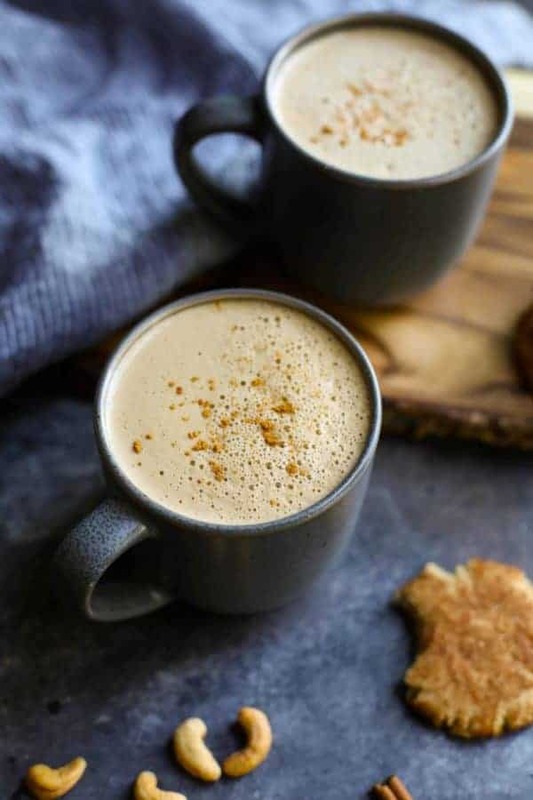 I’ve concocted handfuls of different ‘fatty coffees’ over the past few years using everything from unsalted butter to ghee to MCT oil to coconut oil and have found some serious gems (like this Gut-Healing Cinnamon Coconut Latte and this Pumpkin Spice Butter Coffee). 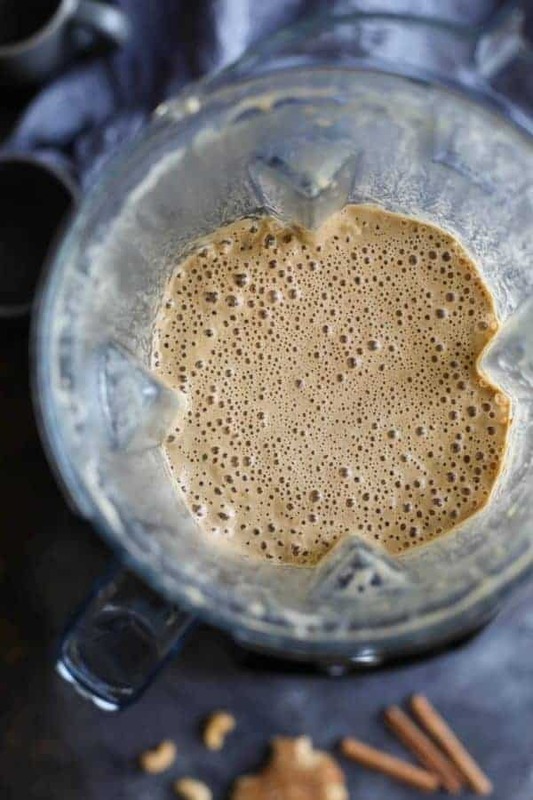 But it wasn’t until I was on a mountain biking trip in Moab, UT last fall with some plant-based friends that I tried adding cashew butter to my coffee in place of the butter, ghee or cream I would normally use. Total face-palm moment. Here I’d been enjoying cashew butter on my sweet potato toast (and, admittedly, by the spoonful), but it never dawned on me to use it my coffee. So into the blender went a dab of coconut oil, a spoonful of unsalted cashew butter, a pinch of cinnamon and a dash of cardamom, and boom! 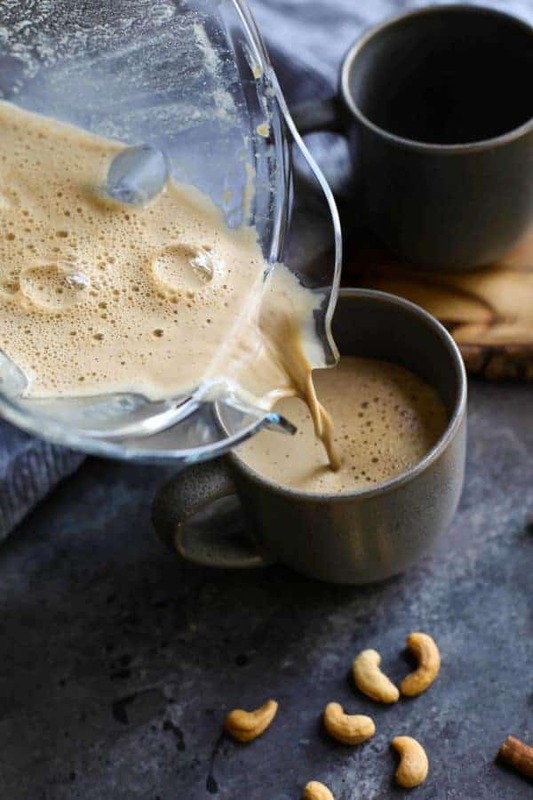 The Snickerdoodle Cashew Coffee was born. It tasted just like my favorite cinnamon-y sweet cookie that my grandma used to make. The plant-based friends loved it too and we all appreciated the fact that we could fill our mugs with this creamy caffeinated delight and head out to the trailhead before the sun came up without having to waste time preparing (and cleaning up) breakfast before we left. 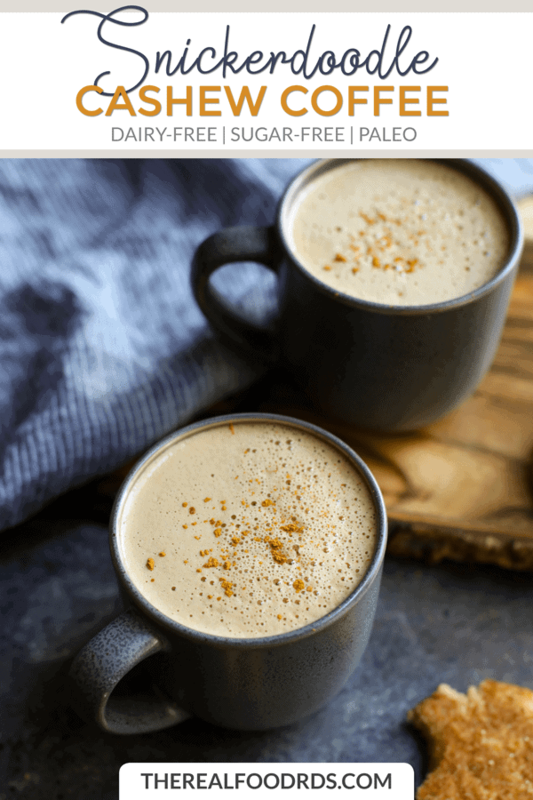 Upon returning from that trip, my obsession with snickerdoodle cashew coffee continued and I starting adding a scoop of Primal Kitchen Collagen Peptides to my morning cup as my pre-CrossFit fuel of choice. 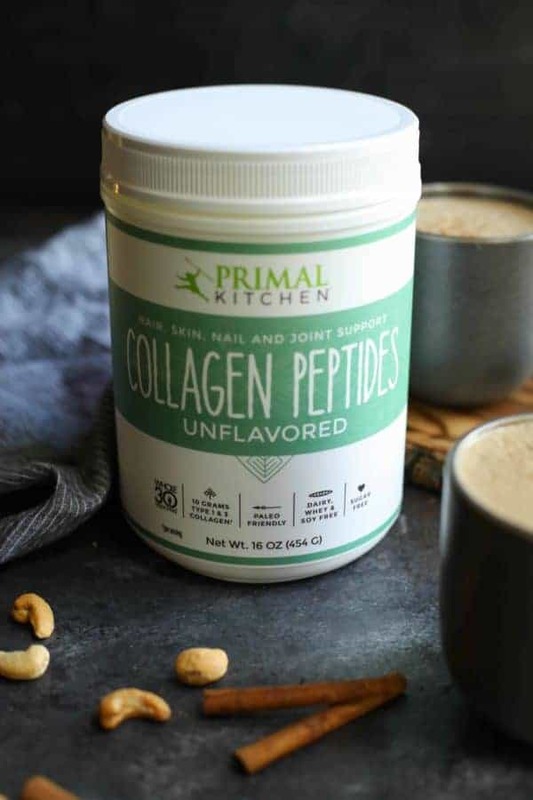 Adding a scoop or two of Primal Kitchen Collagen Peptides to your morning coffee or tea is a great way to support everything from joints, tendons, and muscles to healthy skin, hair, and nails. Which is perfect because as we age our body’s ability to naturally produce its own collagen declines resulting in thin, crepey skin and brittle hair and nails. Collagen can also help strengthen and support the protective lining of your digestive tract which acts as a barrier against toxins, potential food allergens, and harmful bacteria. Primal Kitchen Collagen Peptides are unsweetened and Whole30-approved, sourced from grass-fed cattle and they dissolve easily in hot and cold liquids. 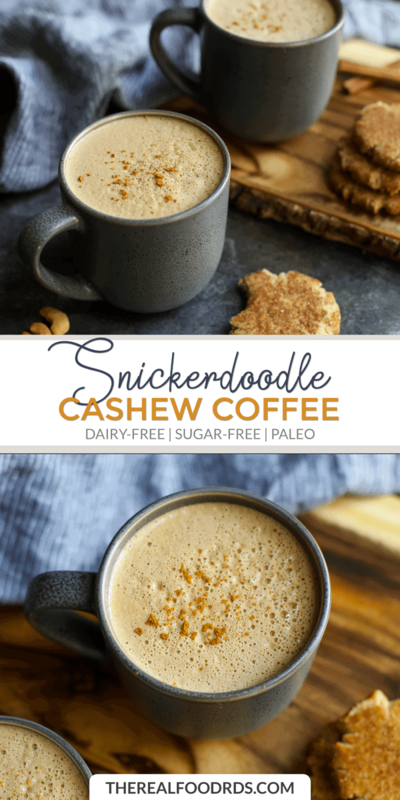 Now, why I waited almost a year to share this Snickerdoodle Cashew Coffee recipe with you is completely beyond me. It’s so good. Enjoy! 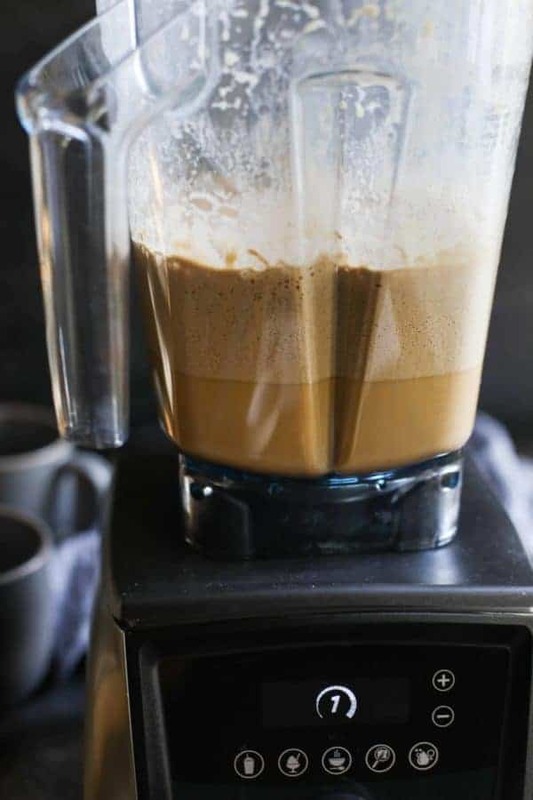 Place all ingredients in a blender and blend on high speed until frothy. Pour into mugs and sprinkle with additional cinnamon, if desired. What’s your go-to coffee or tea drink for busy mornings? Share in the comments below! This sounds like something I definitely want to try. Is there a benefit to using the cashew butter over another nut butter. I tend to have almond butter on hand more than cashew butter. I realize the taste may be different, but I’m just wondering about the texture and potential health benefits of using the cashew butter over the almond butter. There really aren’t any health benefits to using cashew butter over almond butter (or other nut butters). 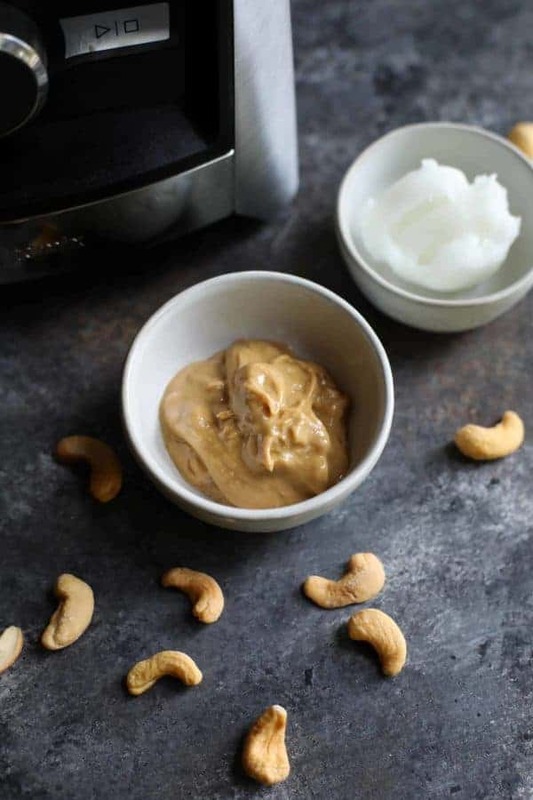 Depending on the almond butter you use, cashew butter may be slightly creamier but again, depends on the almond butter you use. 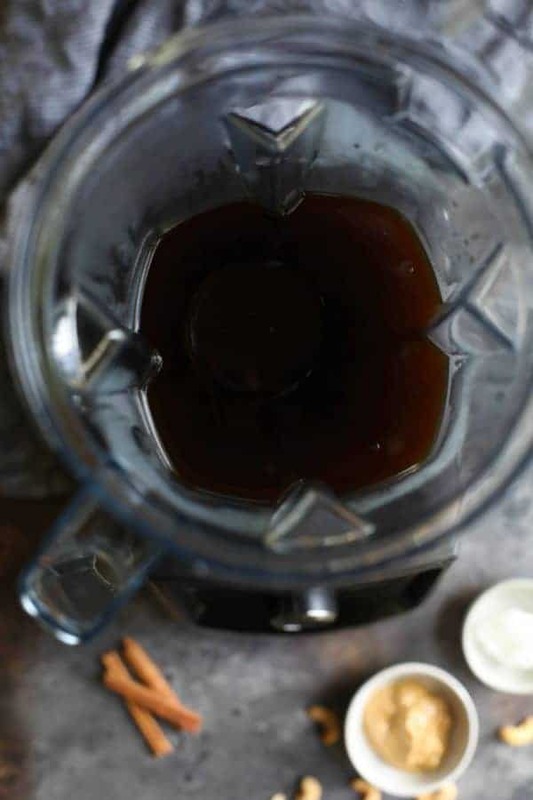 I’ve made it with both kinds – even pecan butter – and although each tastes slightly different, they’re all delicious. Can you use MCT Oil (like Brain Octane by Bulletproof) in lieu of the coconut oil? You can definitely use MCT oil in place of the coconut oil. I’m so glad you enjoyed this! It’s truly a sanity saver for me when mornings get crazy and I’m thrilled that you think so too. Thanks for the recipe! It was delicious but I found it a little chalky. Next time I might cut back a bit on the collagen peptides and add a little almond milk. Other than that it had a nice flavor, and a great balance of coffee with the other flavors. I also enjoyed how it stayed frothy until it was gone! This looks amazing! Could I add a few teaspoons of unsalted cashews instead of the cashew butter? Thank you! I’m not sure the cashews would become creamy enough. Maybe use almond butter instead? I can’t wait to try this! Is it possible to make ahead of time and store in the fridge? I think this recipe would be best to make and enjoy right away. However, feel free to try to make it ahead if you’d like. If you do, we’d love to hear how it works for you!